Florida State University’s Morcom Aquatic Center is a $10.5 million dream-come-true for swimmers, no matter the depth of their commitment to the sport. The open-air facility, located at 2560 Pottsdamer St., boasts an eight-lane, 50-meter long-course pool; a three-lane, 25-yard short-course pool with a diving well and training equipment for divers including trampolines, springboards and gymnastic pads. An identical facility would not be out of place at an Olympic venue. Members of Club Seminole Masters Swimming meets here six days a week to train for about an hour and 15 minutes each day. Its name may sound exclusive, but the mission of the club is strongly inclusive: to give “civilians” from various walks of life the opportunity to enter the water. Masters Swimming coach Steve Wood said club members are united in their desire to swim to stay in shape. “We have people who used to swim in college and are just swimming for the fitness. Some are training for triathlons. Some are training to do Masters swim meets; some just want to learn to get slightly better at swimming,” he said. Club Seminole Masters Swimming members need only to know how to swim and have an enthusiasm for the water. That is, they don’t have to be anywhere near the level of the collegiate athletes who train at Morcom. And, like most anyone, they marvel at divers who leap from the highest 10-meter tall diving platform into the 17-feet deep diving well below. “Anyone who wants to just get a nice workout in — they’re more than welcome to join our (Masters) club. It’s based on their goals,” said Juan Sequera, one of the coaches on staff at Morcom. Club Seminole has members ranging in age from 18 to about 71. “Coach Steve, he really makes sure it’s not just one practice for everyone. It’s really based on what they need. It depends on who attends and how competitive they are,” said Sequera, 24, a 2020 Olympic hopeful. The Masters Club meets Monday, Wednesday and Friday around lunchtime. Tuesday and Thursday practices take place just after the regular workday. Saturday practices run from 10:15 a.m. to 11:45 a.m.
Wood is 28 and has been swimming since he was a freshman in high school. He majored in sports administration and minored in coaching and communications at Southern Illinois University-Carbondale. Wood plans all workouts for the Masters practices. The club rents out three of the eight lanes in the long course pool for practices. Masters share the lanes and “circle swim” — swimming down one side of the lane and up the other — when necessary. Wood said the swimmers’ range in abilities does not prevent them from being able to work out together. “It’s fun for them to see someone that’s on a different level than they are. And they learn from each other, too. They sometimes are coaching just as much as I am, just talking to each other in the lanes,” Wood said. Club Seminole fees are either monthly or seasonal and cover the cost of renting lanes, pull buoys and kickboards. “That’s another thing Morcom does really, really well: There’s enough equipment for daily patrons and Masters swimmers to borrow, and then they just use it for whatever we’re doing that day,” Wood said. Practices are held rain or shine. The aquatic center observes rules prohibiting swimming during thunder, but other than that, the show goes on. “There are some days where I’m standing on the pool deck and a random storm comes through and I’m as wet as they are,” Wood smiled. Motivations among club members vary. Most of the members are not trophy hunters. 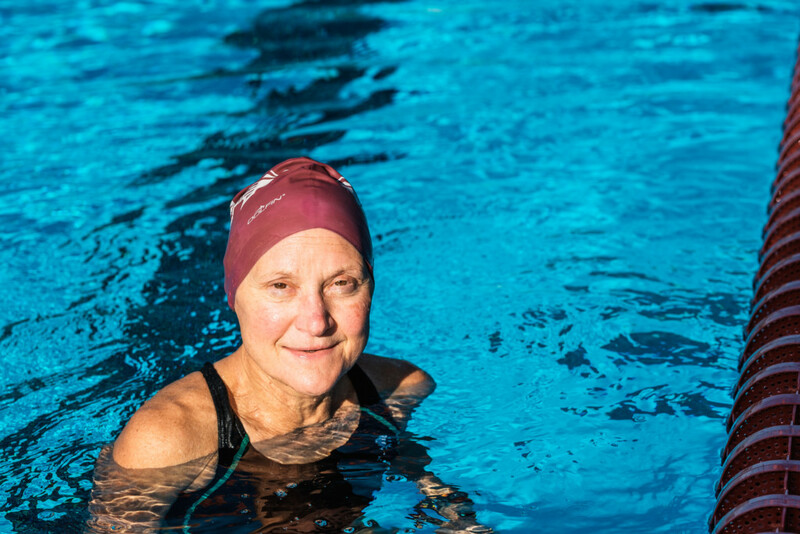 Wood explained that many of the Masters swimmers are former runners who have taken up swimming as a way to stay in shape, attracted by the low-impact nature of the sport. For Elizabeth Laurienzo, 67, the club has been central to a 10-year commitment to rehabilitation. A car accident she suffered in 1981 at age 24 led to chronic, crippling arthritis. “The coaches are very good at working with you to change your individual workout to benefit the individual swimmer,” Laurienzo said. The larger pool at Morcom is kept at 80 degrees. There are practices, Wood said, where an older member may ask to swim in the 82-degree smaller pool to avoid the colder temperature that may aggravate a pre-existing injury. In such cases, Wood walks back and forth between the pools to check on the progress of the separate swimmer. The coach said he knows of a few Masters programs where 20 or so swimmers will go to a meet, but the Tallahassee club is smaller. If a member is interested in competing outside the club, Wood will help him or her sign up and create a workout regimen ahead of time. Wood noted the beauty of the outdoor facility is a big draw for the Masters program, especially on a Florida spring day.